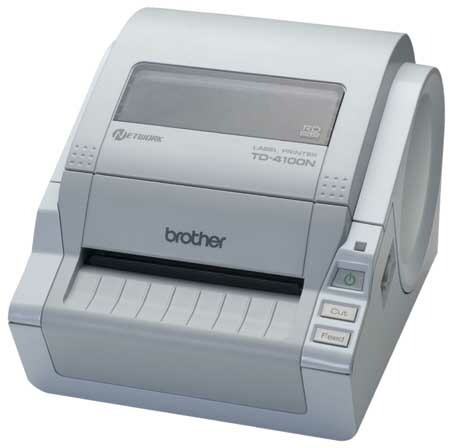 The Brother TD-4000 and TD-4100N desktop barcode and label printers represent a great value at an affordable price. They feature a four-inch wide print head, high-resolution printing, fast throughput, and a built-in auto cutter, all of which make these printers an excellent choice for many vertical market applications. The powerful Brother P-touch® Editor label design software is included with each printer to help you design and print customized, on-demand labels for just about any application. You can create labels, receipts, and tags with text, graphics, and over 14 industry-standard linear and 2D bar codes. In addition, you can use P-touch Editor to connect to and print from a variety of data files, includes text and CSV files, Excel® spreadsheets, and Microsoft® Access® and SQL Server® databases. Both printers measure 6.8" (W) x 9.0" (D) x 6.2" (H), and are perfect for desktops and counters where space is at a premium.